The electronic signature (eSignature) has facilitated business operations for almost two decades. An eSignature locks in legally binding documents in business and personal interactions every day all over the world. A large part of their acceptance hinges on tight legal and security measures and a simple user interfaces. eSignatures are as legitimate for business contracts as a signature created in ink on paper. The Electronic Signatures in Global and International Commerce Act which came into effect in the year 2000 made eSignatures valid all over the globe. Despite the incredible growth in eSignature adoption, there are still significant reasons constraining eSignature completion rates. We’ve identified the top 4 reasons why your eSignature completion rates are so low and share with you ways to fix them. Thousands of businesses today use eSignature software to conduct business. Sales contracts, employment paperwork, procurement and purchasing documents and more are finalized via eSignatures. So while email used to be the go-to delivery mechanism, today inboxes have been abused and have lost their visibility. Now emails take a back seat to texts, social and almost everything else. When you consider receiving 120 emails a day, it’s hard to imagine any emails getting the cut through they used to have. Today, its more likely that emails will wallow in your inbox until one day you purge them, forget about them, or even change email provider. Letting critical documents and contracts decay in email boxes is not a strong business strategy when it comes to critical business processes. So, if receiving documents signed and completed is important to your business, it’s probably a good idea to find an alternative delivery method for your eSignatures to ensure you get a higher completion rate. So, you’ve crafted the perfect document package and sent it to your customers. To complete the transaction, you just need the appropriate eSignature and the contracts will be completed. But, for some reason, people aren’t responding to your carefully crafted documents. Why? We are simply expecting too much from today’s distracted customers. Customers want processes and contracts to be simple. They are not interested in sorting through the docs and trying to figure out what is expected of them. In many instances, the documents businesses send to customers are not as clear as they might hope for. They often are misunderstood and cause the customer to hesitate or abandon their process. Moreover, many important, formal documents can look scary – especially when there’s no one available to provide clarifications and explanations. With these ‘scare factors’ so prevalent in contracting, it’s important to provide simply mechanisms for customers to understand and complete their documentation. Customers oftentimes need guidance and clarification that rudimentary digital signatures don’t account for. As a result, such signatures are typically sent to customers but then customers abandon the processes -having been scared off by the heaviness of the process and the lack of immediate reassurances. So when you send out your digital documents for signatures, do your customers have the ability to review documents live and collaborate with an agent that answers any and all questions? We’re definitely living in a mobile world and your business processes must reflect that. This is especially true when you are asking customers to complete and sign any formal documents – you need to anticipate and simplify how they will be received and completed on a mobile phone. There has been a seismic shift in digital communications and the electronic signature your organization is using could be causing your conversion rates to plummet. The reason is that within the last couple of years, mobile web usage compared to desktop has skyrocketed. Some stats to consider: The percentage of people visiting mobile devices grew from 57 % to 63%; the percent of time spent on mobile devices increased from 40% to 49%. If you are sending customers heavy documents that assume full keyboard and screen visibility, your mobile customers are going to have a tough time. Customers are simply not in front of their desktops as they used to be, nor do they have the patience to try and navigate clunky documents on a 4 inch mobile phone. Several studies point to a faster than expected shift from desktop to mobile usage. However, most first generation eSignature solutions require mobile users to access their email, and then present their documents in full Letter size or A4 presentation on small screens. So while they are in fact mobile accessible, they fail to deliver a mobile-optimized experience. This poor mobile experience is hurting completion rates. It’s probably happened to you at some time. You receive something in the mail or email and the message is just vaguely familiar. And on top of that, the message indicates that a company is waiting on your signature to complete your sale. Most people in that situation simply toss the communication because it has no relevance at the moment. In all candor, the sending company means no harm, they just want to sign you complete what they thought you already agreed. But, by the time you get the email or letter, you’ve lost all context. It’s lost all the excitement that you had to close the deal. Now, it looks like what it truly is: a legal document with lots of fine print. No benefits. No features. No reason to buy. When eSignature requests are made in a vacuum, they’re likely to stay there. However, if a potential customer receives an eSignature request after having heard the company’s product with benefits and terms, they are more likely to respond and complete the document with an eSignature. There are some criteria to consider when creating an eSignature solution consistent with consumer behavior and great customer engagements. First, is the solution easy to use? If your clients are required to scan documents, they’re more likely to abandon the entire eSignature process. To boost completion rates, it’s crucial that your users’ experience be seamless, particularly for on-the-go customers, so that they can complete any task directly from their mobile phone in one shot. You’ll want to use an eSignature that enables different solutions, like agent-assisted or self-serve options. For your agents, an eSignature solution should be easily incorporated into your organization’s wider processes and workflows, including contracting, form filling and collections. And if you manage to find an eSignature that integrates with your current CRM system, all the better. To increase form completion rates, your eSignature should facilitate an open, real-time and secure customer-agent collaboration. For instant processing, it’s important to find a solution that’s compatible with your organization’s document generation and other systems. A next-generation eSignature that enables live collaborative document review and instantly completed signatures will enhance the customer experience while reducing the chance of abandonment due to customer frustration. Ideally, your eSignature will be able to facilitate the completion of the entire process, everything from ID/document collection to form-filling and payments. Ultimately, the goal of every agent/customer interaction is to close as quickly as possible, with electronic signatures being one component of this process. Next-generation eSignatures that are part of a wider, customer-centric system are making it possible for agents to instantly collect documents, eSignatures and payments while customers are on the phone. This use of next-generation eSignatures streamlines workflows, ticks up customer satisfaction and increases completion rates. In short, next-generation mobile-ready eSignatures unlock enormous value from their customer interactions. 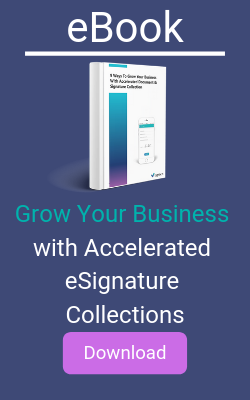 Next generation eSignature solution make it easy to boost eSignature completion rates by removing friction that impacts your contact center’s KPIs, and revenue growth strategies.